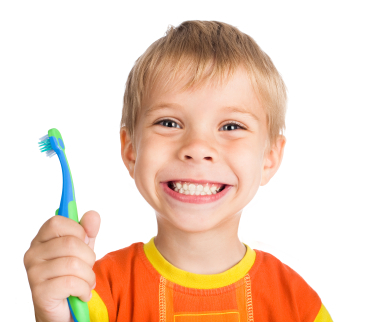 Fluoride is an important mineral that should be given to all children starting at 6 months of age. If fluoride is not in the water supply (or if the infant is breastfeeding), then a fluoride supplement may be needed and can be obtained from your dentist or pediatrician. Most bottled spring water found in stores is not fluoridated, unless stated on the label. Speak with your dentist or doctor about the right amount of fluoride to include in the diet. It's important not to get too much or too little. When oral bacteria feed on sugar, they produce acids which can cause cavities. How often sugar is eaten and how long it remains on the teeth is more important than how much. Any carbohydrate can lead to cavities because it provides a food source for the bacteria that cause them. Carbohydrates that are "sticky" (such as raisins, granola bars, candy, cookies, potato chips) stay on the teeth longer and allow the bacteria more time to grow. Additionally, sugared beverages and the juices from whole fruit can seep between teeth. Common snack foods such as pretzels or crackers can be eaten with protein/dairy foods (peanut butter, cheese, eggs, etc.) to lower the cavity-causing effect. In addition, whole grains are better than refined carbohydrates in terms of sticking to the teeth.